Research on the brains of infants suggests that babies understand certain concepts before they can communicate them. At birth, a baby's brain contains all the neurons necessary for a lifetime of learning - 100 to 200 billion brain cells. A baby is born ready to learn. 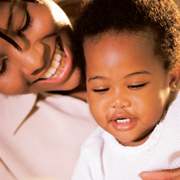 However, brain development and a baby's capacity for learning is heavily dependent on early life experiences. Connections need to be formed between a baby's neurons. These connections, called synapses, form critical pathways that permit information to travel through the brain. A child's capacity to learn is directly related to the number of pathways that are formed and strengthened. Talking and reading to babies helps brain neurons to connect. When a connection is used repeatedly in the early years it becomes permanent; those not used may perish. Over the first year of life, a baby's brain more than doubles its size. During this time, the brain is preparing for future learning success by beginning to develop language skills and to understand cause and effect. Research on the brains of infants suggests that babies understand certain concepts even before they can communicate them. For example, babies can count, remember previous events and can solve simple problems, such as manipulating a rattle to hear its soothing rhythm. Over time, babies recognize the faces and speech patterns of their caregivers, see colors and begin to distinguish between tastes. A baby's brain is working very hard to quickly process new sensory experiences and store that information for future use when they can talk, walk and interact with their environment. The more experiences parents provide to their babies, the more opportunities babies have to permanently establish learning pathways in their brains.